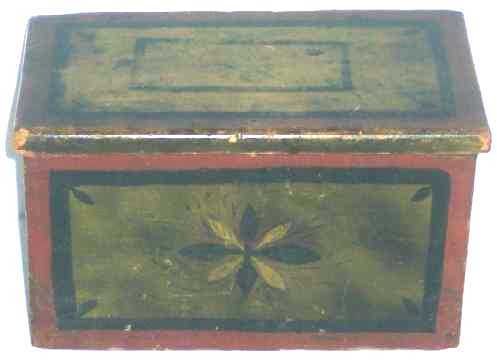 Presented here, a wonderful Folk Art Box made of Pine with Smoke Graining and Floral Decoration on the front and ends. These smaller boxes may well have served as informal dressing boxes accommodating toiletries or "gewgaws", according to Nina Fletcher Little in Neat and Tidy. Also, the absence of a lock minimizes the likelihood of having contained valuable contents but rather a lady's trinkets which may have included chains, beads, buckles, ribbons and other small ornaments of everyday attire. It would have rested conveniently on the top of a chest or table, easily within reach of its owner. Dating from the late 18th century to early 19th century, it is in very fine condition and measures 8" long x 4-3/4" wide and 4-1/2" high and is most likely from Pennsylvania. A sweet little Folk Art box for my lady's treasures.